Adlib is supplying lighting, sound, rigging equipment and crew for the current Elvis Costello and The Imposters ‘Revolver’ UK and European tour. It's the first time that the Liverpool based company has worked with the highly acclaimed musician and songwriter who cut his teeth in the London pub rock, punk and new wave scene in the 1970s. His hugely successful, dynamic and colorful career has seen numerous awards and accolades, he has been hailed as a great innovator as well and an incisive social commentator. Adlib’s account handler Phil Stoker states: "Working with someone of Elvis’s stature is fantastic and production manager Milo Lewis and engineers Fern and Nathan have been great to deal with all along the way." The format of the show is that there’s no formal set list. Songs are chosen – enough to fill nearly three hours of performance – largely by audience members invited up onstage to spin a giant wheel bearing different song titles. There is a pool of over 100 potential numbers in total. This concept of spontaneity and anticipation has been a massive hit and keeps everyone on their toes. One of ADLIB’s JBL VerTec systems was specified, chosen for its versatility and ability to be easily ground stacked as well as flown. Playing primarily high-end theatre and concert hall venues - including three sold out nights at London's Royal Albert Hall - not all of these offer full flying facilities, so it’s been a good system to cater for a variety of scenarios. ADLIBs Steve "Patto" Pattison and Pete Seddon are FOH and monitor system engineers respectively, ensuring that Costello's engineers Fernando "Fern" Alvarez and Nathan Payne achieve the best possible results with the system each day. The standard set up is 12 VerTec 4889 elements per-side with 3 or 4 VT4880A subs ground stacked. For the Albert Hall, 28 additional 4889 boxes were added to the rig taking the main hangs to 14 a-side with additional side hangs of 11 each. The 4889s are being driven by Camco Vortex 6 amps which Adlib has found to be a winning combination. For the RAH, the side hangs were powered by the new Crown ITECH 4x3500HDs. For front/lip fills they are using Adlib AA281s to cover the very front seats, and for the corner spots of the room, there are three L-Acoustics ARCS boxes a-side. Alvarez specified an Avid Profile, his console of choice for around nine years, on which he is using all the onboard effects. It’s a clean, straightforward no-nonsense show that is essentially an updated version of what would have been the ‘classic’ set up back in the heyday of punk. For system processing and EQ they are using four Lake LM26s. On stage, monitor world is overseen by Adlib’s Pete Seddon, who ensures that Nathan Payne’s days are as painless as possible. The random situation introduced by the wheel means they must be prepared for guests appearing suddenly, depending on where the wheel lands. Payne uses a DiGiCo SD 10 console, picked for its channel count. 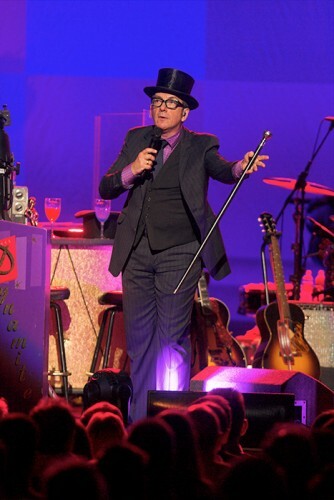 Costello plus his three band members are all on IEMs – they are running a Shure PSM1000 wireless system, complete with Sennheiser 3732 hand-held mics and Shure Q5s for the guest vocalists. The move to in-ears is relatively new, so there are still a few wedges – ADLIB’s popular low profile MP4s – dotted around, for Elvis at strategic moments when he removes an ear and for guests onstage and even for the dancers in the go-go cage. Payne records the monitors each night so they can do a virtual sound check if needed. The inputs from the SD10 go out via MADI to hard drive recorders, which are then played back via the console running in MADI mode, giving him access to everyone’s mix - with the mics replaced by the recordings. Being accomplished and experienced musicians, they are very thorough, detailed and easy to work with in that respect. They know their stuff when it comes to audio and also what they want and need to hear. "Everyone is a joy to work with on this tour," enthuses Seddon. Adlib was able to offer a great lighting package to production manager Milo Lewis combining both lighting and sound, with all the advantages that having a single source supplier brings to a production. Adlib’s Neil Holloway created the lighting design using a careful blend of classic and contemporary. 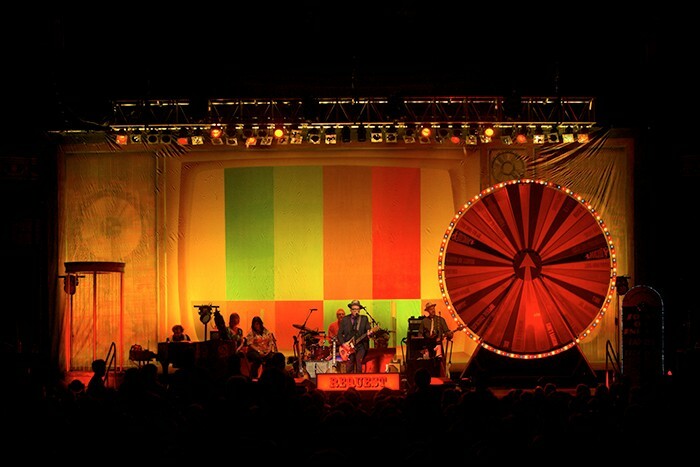 The band chose the backdrop, which they have used previously and really like – a faded old fashioned TV set - and there are a series of quirky circus style props onstage, the most prominent of which is the song wheel. Holloway wanted to lose some of the PAR 64s from their previous rig and make it a bit more tourable and less power hungry, so he replaced all those that were on the front truss with 10 ETC Source Fours (a mix of 19 and 25-50 degree lenses) and four Martin MAC Aura LED washes. The back truss – trimmed just at the top of the backdrop, is made up of five sections of pre-rig, loaded with seven bars of PARs plus four MAC 700 Spots for some rear key light and solo pick-ups and general contrast in light. On the floor are another eight MAC Auras, which happen to be a personal favourite of Holloway and are also liked by the band. For some eye-candy and adding to the general idiosyncrasy of the stage, are four JB Lighting A8 LED fixtures and two A12s, which highlight the band from behind. Basic pixel mapping is used on these – they are zoned into eight sections - to produce some whizzy effects. Sweeping up the backdrop bringing some rich psychedelic colour to the area are 12 Philips CK ColorBlaze LED battens. Also feeding into Holloway’s grandMA2 light console are the LEDs around the perimeter of the wheel. It’s the first time he’s used the MA2 light as a busking console which is working "very well" he confirms. It’s not a massive amount of fixtures for the show which is challenging due to the ‘on-the-fly’ operation, which Holloway is really enjoying. "Simple and flexible" was the key he comments, adding that it’s all about ‘looks’ and textures that he can build from the lighting as there is no haze allowed, so the lights themselves are almost imperceptible until they hit the stage and the band. At the RAH they utilized the house front truss and advanced bars and their Clay Paky Halo Wash 1200s together with 10 Source Four Revolution moving lights.